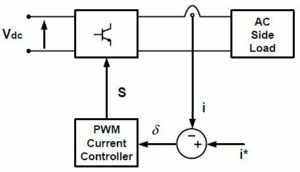 Current control based on hysteresis algorithms are widely used in different applications, such as motion control, active filtering or active/reactive power delivery control in distributed generation systems. The hysteresis current control provides to the system a fast and robust dynamic response, and requires a simple implementation in standard digital signal platforms. On the other hand, the main drawback of classical hysteresis current control lies in the fact that the switching frequency is variable, as the hysteresis band is fixed. 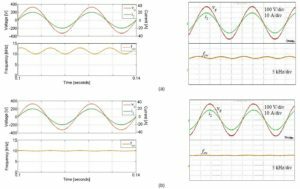 In this paper a variable band hysteresis control algorithm will be presented. As it will be shown, this variable band permits overcoming the aforementioned problem giving rise to an almost constant switching frequency. The performance of this algorithm, together with classical hysteresis controls and proportional resonant (PR) controllers, has been evaluated in three different single-phase PV inverter topologies, by means of simulations performed with PSIM. In addition, the behavior of the thermal losses when using each control structure in such converters has been studied as well. Fig. 1. Basic Current Control Scheme in a single phase inverter. Fig. 2. Behavior of the current and the voltage at the output of the converter when using the H5 topology. Fig. 3. Behavior of the current and the voltage at the output of the converter when using the HERIC topology. Fig. 4. Behavior of the current and the voltage at the output of the converter when using the or HB-ZVR topology. 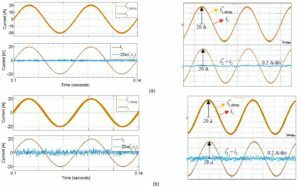 A hysteresis current control algorithm based on an adaptive hysteresis band for single phase PV converter topologies has been presented in this paper. 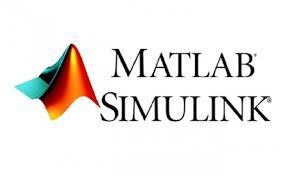 As it has been shown analytically and by means of simulations this algorithm permits obtaining a fixed switching frequency in all the tested topologies. 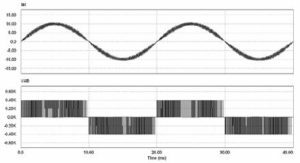 The main drawback of the conventional fixed hysteresis band current control is that generates excessive current ripple because modulation frequency varies within a band. This modulation frequency variation makes complicated the output filter design. 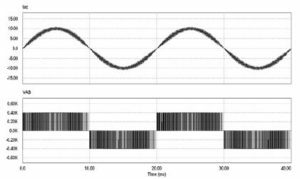 Adaptive hysteresis band current control keeps the good performance of the fixed band hysteresis current control and additionally permits an easier output filter design due that the switching frequency is almost constant. On the other hand, switching losses can be reduced by using this adaptive hysteresis band current control. The analyzed topologies are the more widely used in transformerless single-phase PV systems (H5 and HERIC). Based in the previously comparative simulations results it can be concluded that in the case of H5 topology losses are concentrated in S5. In case of HERIC topology losses are located among S1, S2, S3 and S4. Finally in HB-ZVR single phase topology, losses are located in S5. These results mean that in each case, the losses distribution is not the same and a different thermal design should be done. Malesani, P. Mattavelli, P. Tomasin, “High Performance Hysteresis Modulation Technique for Active Filters”, IEEE Transactions on Power Electronics, Volume 12, September 1997. Holtz and S. Stadtfeld, “A Predictive Controller for the Stator Current Vector of AC Machine-fed from a Switched Voltage Source”, in Proc. Int. Power Electronics Conference Rec. (Tokyo), 1983, pp. 1665-1675. Ciobotaru, R. Teodorescu, and F. Blaabjerg, “Control of Single-Stage Single-Phase PV Inverter”, European Conference on Power Electonics and Applications, 2005. Hayashi, N. Sato, K. Takahashi, “A Novel Control of a Current- Source Active Filter for ac Power System Harmonic Compensation”, IEEE Transactions on Industrial Applications, Vol. 27, No. 2, March/April 1991. Kato, K. Miyao, “Modified Hysteresis Control with Minor Loops for Single-Phase Full-Bridge Inverters”, Doshisha University, Kyoto Japan, 88CH2565-0/88/0000-0689$01.00, 1988 IEEE. 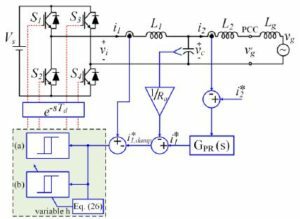 This paper presents variable and fixed switching frequency based hysteresis current control (HCC) methods for single-phase grid-connected voltage source inverters (VSI) with LCL filter. The main feature of the proposed HCC methods is that the reference inverter current is generated through a proportional-resonant (PR) controller for achieving zero steady-state error in the grid current. The consequence of using PR controller is eliminating the need for using derivative operations in generating the reference inverter current. Furthermore, active damping method is employed to damp the LCL resonance. An equation is derived for variable switching frequency. Fixed switching frequency operation is achieved by modulating the hysteresis band. The performance of both HCC methods has been validated by simulation and experimentally. It is reported that the proposed HCC methods not only preserve the inherent features of the conventional HCC methods, but also damp the LCL resonance using an active damping method and guarantee zero steady-state error in the grid current. Fig. 1. Single-phase grid-connected VSI with the proposed HCC methods. (a) Variable switching frequency based HCC, (b) Fixed switching frequency based HCC. Fig. 2. Simulation and experimental results of , , , and obtained by: (a) the variable switching frequency based HCC, (b) the fixed switching frequency based HCC. Fig. 3. Simulation and experimental results of , , and obtained by: (a) the variable switching frequency based HCC, (b) the fixed switching frequency based HCC. In this study, variable and fixed switching frequency based HCC methods are presented for single-phase grid-connected VSI with LCL filter. Unlike the conventional HCC methods, the proposed HCC methods employ the reference inverter current generated with the PR current controller by processing the grid current error. The use of PR controller ensures zero steady-state error in the grid current independently from the hysteresis bandwidth. In addition, the need for using derivative operations in generating the reference inverter current is eliminated by using PR controller. Also, active damping method is employed to damp the LCL resonance. A formula is derived for the variable switching frequency. The fixed switching frequency operation is achieved by modulating the hysteresis band obtained from the derived variable switching frequency equation. The performances of both HCC methods are validated by experimental investigation. These results show excellent performance in terms of dynamic response, robustness, zero steady-state error, and low THD in the grid current. Hence, the proposed HCC methods not only preserve the inherent features of the HCC methods, but also damp the LCL resonance using an active damping method and guarantee zero steady-state error in the grid current. Blaabjerg, R. Teodorescu, M. Liserre, and A. V. Timbus, “Overview of control and grid synchronization for distributed power generation systems,” IEEE Trans. Ind. Electron., vol. 53, no. 5, pp. 1398–1409, Oct. 2006. Abu-Rub, M. Malinowski, and K. Al-Haddad, Power Electronics for Renewable Energy Systems, Transportation and Industrial Applications. Hoboken, NJ, USA: Wiley, 2014. Pena-Alzola, M. Liserre, F. Blaabjerg, R. Sebastion, J. Dannehl, and F. W. Fuchs, “Analysis of the passive damping losses in LCL-filter-based grid converters,” IEEE Trans. Power Electron., vol. 28, no. 6, pp. 2642–2646, Jun. 2013. 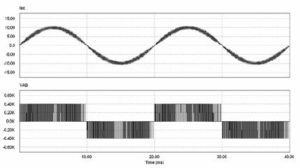 Dannehl, F. W. Fuchs, S. Hansen, and P. B. Thogersen,”Investigation of active damping approaches for PI-based current control of grid-connected pulse width modulation converters with LCL filters,” IEEE Trans. Ind. Appl., vol. 46, no. 4, pp. 1509-1517, Jul./Aug. 2010. Pan, X. Ruan, C. Bao, W. Li, and X. Wang, “Capacitor-current feedback active damping with reduced computation delay for improving robustness of LCL-type grid-connected inverter,” IEEE Trans. Power Electron., vol. 29, no. 7, pp. 3414–3427, Jul. 2014. ELECTRICAL ENGINEERING is a field of engineering that generally deals with the study and application of electricity, electronics. This field first became an referable occupation in the later half of the 19th century. After degradation of the electric telegraph, the telephone and electric power distribution and use. Finally, broad casting and recording media made electronics part of daily life.The invention of the transistor, and later the integrated circuit, reduced the cost of electronics. Thus it can be used in almost any household object. 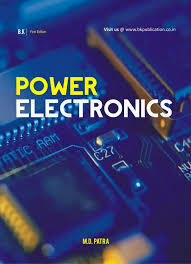 POWER ELECTRONICS is the application of solid-state electronics to the control and conversion of electric power. The first high power electronic devices were mercury-arc valves. In modern systems, the semiconductor switching devices performs the conversion. Examples of these devices are diodes, thyristors and transistors, pioneered by R. D. Middlebrook and others beginning in the 1950s. In contrast to electronic systems, in power electronics substantial amounts of electrical energy are processed. An AC/DC converter (rectifier) is the most typical power electronics device. It is found in many consumer electronic devices, e.g. television sets, personal computers, battery chargers, etc. The power range is typically from tens of watts to several hundred watts. In industry a common application is the variable speed drive (VSD) that is used to control an induction motor. The power range of VSDs start from a few hundred watts and end at tens of megawatts. An ELECTRIC POWER SYSTEM is a network of electrical components deployed to supply, transfer, and use electric power. An example of an electric power system is the the grid that provides power to an extended area. An electrical grid power system can be broadly divided into the generators, the transmission system and the distribution system. The generators supply the power. The transmission system carries the power from the generating centres to the load centres. The distribution system feeds the power to nearby homes and industries. Smaller power systems are also found in industry, hospitals, commercial buildings and homes. The majority of these systems rely upon three-phase AC power—the standard for large-scale power transmission and distribution across the modern world. Specialised power systems that do not always rely upon three-phase AC power are found in aircraft, electric rail systems, ocean liners and automobiles.